I am not a believer in numerology, but a confluence of related numbers caught my attention a while ago. Here is what I noticed. My next birthday would be my 84th. I started swimming in ’48. 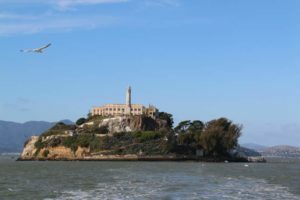 Over the years I have done 41 swims from Alcatraz Island to San Francisco. 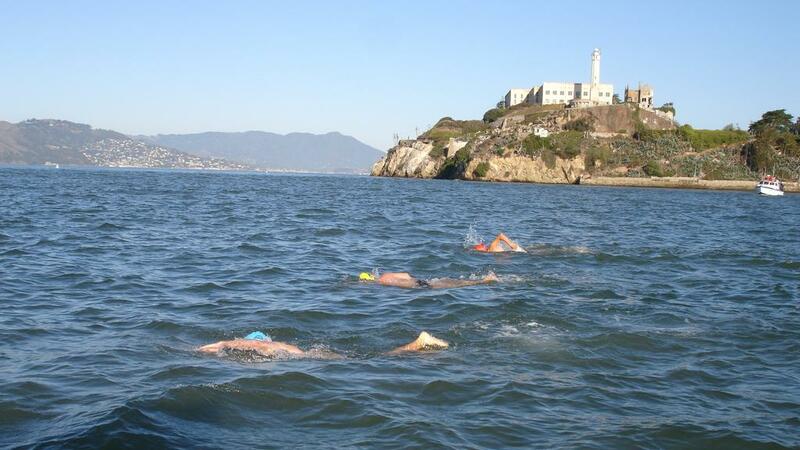 If I do just one more Alcatraz swim, that will give me a total of 42. Hmmm! Look at these numbers: 84 is the inverse of 48 and 42 is exactly half of 84. Perhaps there is something to numerology. Could those numbers be telling me that I should attempt just one more Alcatraz swim? Maybe, but at 84 was it reasonable for me to try something that I have not done for a very long time? All I could do was try, aware that it would take months of hard training to get my ancient body ready for an Alcatraz swim. I decided to give it my all, damn the torpedoes. Besides, I love having a goal. The target date for the swim: my birthday September 7, 2018. The plan: have a Zodiac take me out to Alcatraz and guide me to the South End Rowing Club, immediately south of Alcatraz. Water temperature: high 50s. Strong currents. No wetsuit, and I expected to be in the water about an hour. There is a club tradition at the SERC that when you do a birthday swim, you swim in your birthday suit. And there are critters in San Francisco Bay that like to chaw on visitors. A nasty sea lion? Sharks? I can do nothing about the critters. After all, it is their home. Increase my monthly yardage, including a weekly long, uninterrupted swim. Almost all of my swimming has been in a warm 25-yard pool; I need open water workouts. That means swimming in the Columbia River and in the Pacific. Acclimate to cold water two ways. First, the Columbia River, and Nehalem Bay on the coast. Then in late August spend two weeks swimming in Lake Tahoe, CA, high altitude and cold water. The first part was easy to conceive but laborious in practice. Starting in June I slowly raised my monthly yardage to over 40,000 then 50,000 yards. That is a lot for me. The swims at Nehalem Bay and in the Columbia turned out to be fun, using the trips for a day out with my wife, Sylvia. One unexpected problem was weight loss due to increased exercise load. The solution, eat more, darn it. Oh, the suffering we endure for our sport! We were at Squaw Valley/Lake Tahoe from August 19 to September 6, with daily cold-water swims in Lake Tahoe and Donner Lake, between 6,000’ and 7,000’ altitude. Breathing while swimming for the first several days was difficult. I was stopping frequently and turning over for a relaxing backstroke. During the second week my new red blood cells gave me more endurance, making my swims more enjoyable. On September 6 we drove to San Francisco for the showdown. At 9:00 AM on September 7, the Zodiac was ready, piloted by Gary Emich, an old friend from San Francisco’s South End Club. The tides were not ideal, but you take what you get on your birthday. Apprehensive, I jumped from the Zodiac at 9:30, towards the end of a flood current, just south of Alcatraz. To my left, my breathing side, was my friend ‘Fast Eddie’ Peinado. He was never more than ten feet away. The last eleven minutes were a struggle, swim 50 strokes, rest, repeat. I finally touched the concrete base of Pier 33, not my target, but a finish nonetheless. 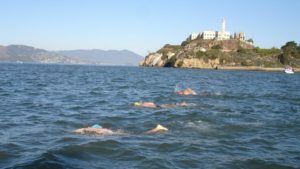 I made it from Alcatraz to San Francisco in 61 minutes 1 second, not a fast swim, but good enough for me. The numbers played out. 84 years old; 42 Alcatraz swims; swimming since ’48. Here’s another one: Legal drinking age when I was growing up was 21, exactly a quarter of my current age. So Gary, Eddie and I each downed a beer at my celebratory birthday lunch. Just one beer, not 21. And here is one more thing to ponder about numbers: In my foreseeable future there will never again be such a confluence of numbers as this year. Does that mean that I will never have to do it again? I think I can live with that. Joe, you are an inspiration, determined and amazing! If I had not read this, I wouldn’t believe it! What a unique and crazy way to spend your retirement. Bravo, you set a goal and found a way to meet it!! Some people would have quit in the middle or froze to death, but not Joe!! Congratulations!